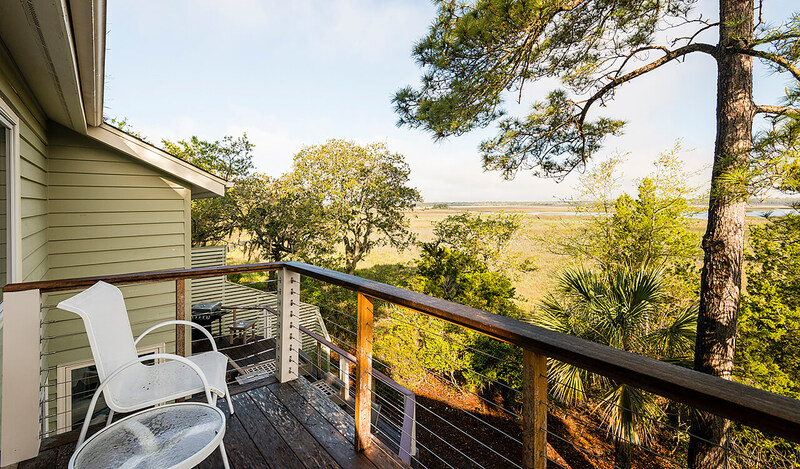 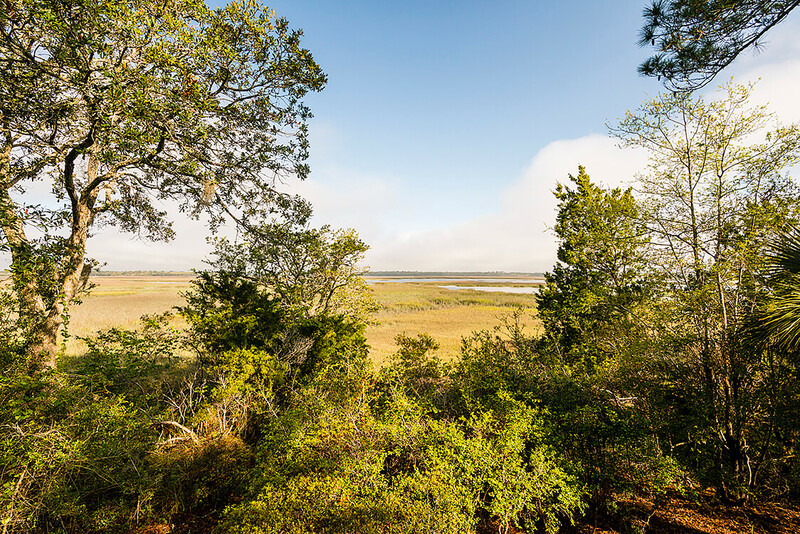 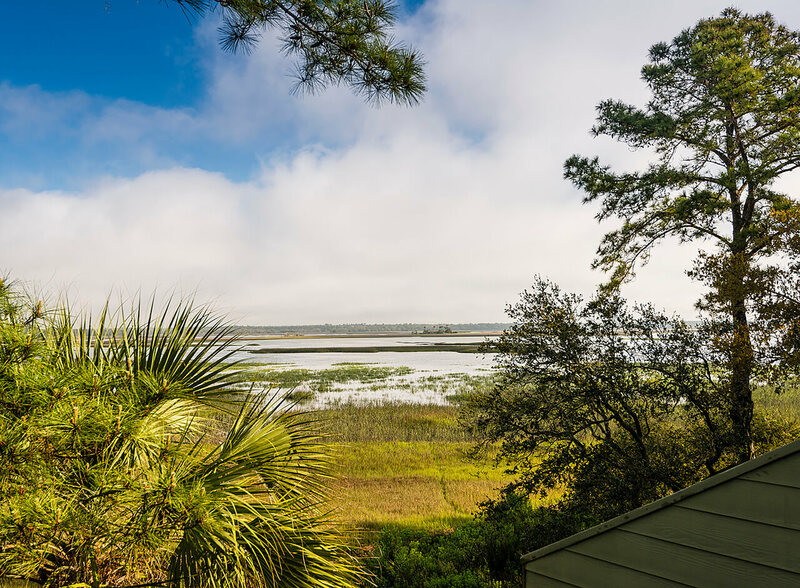 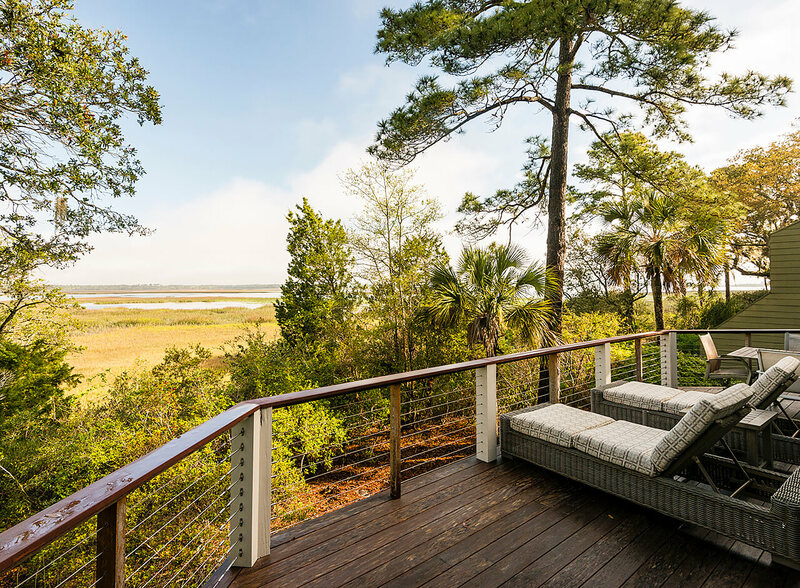 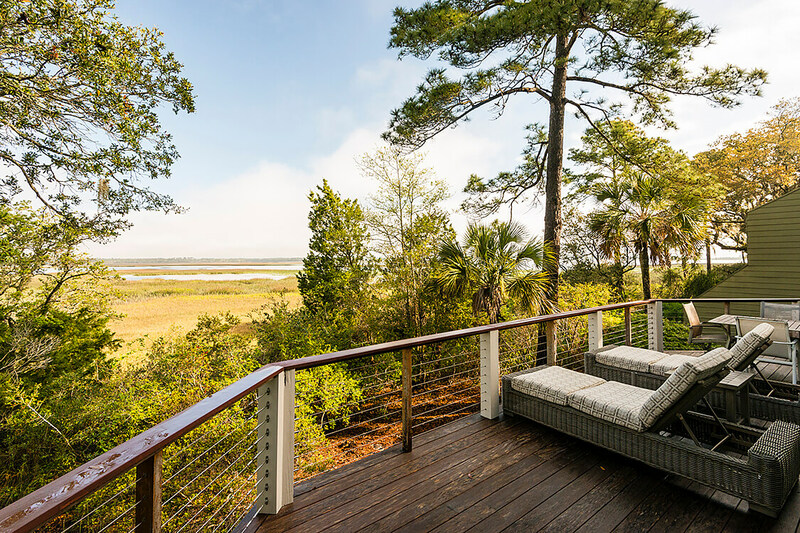 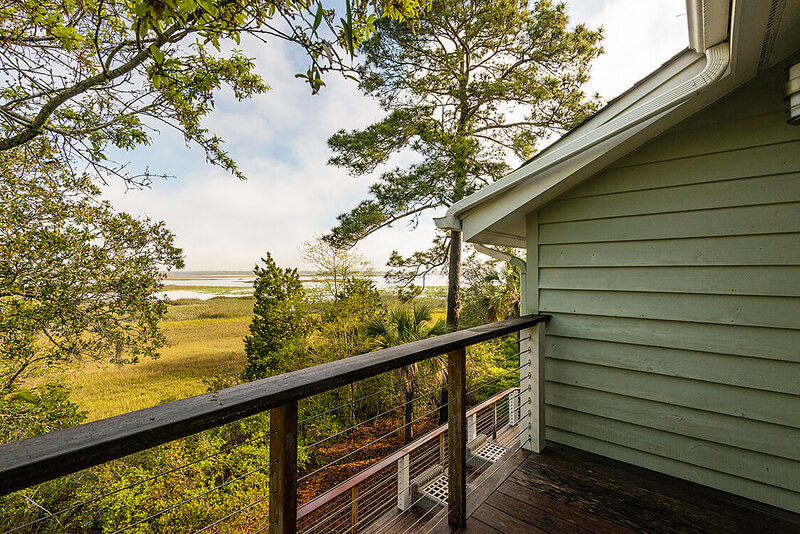 The clean-lined, contemporary home at 175 Marsh Hawk Lane, designed by Ehni & Associates, offers an open floor plan and stunning 180-degree views of the Kiawah River and its tranquil marshes. 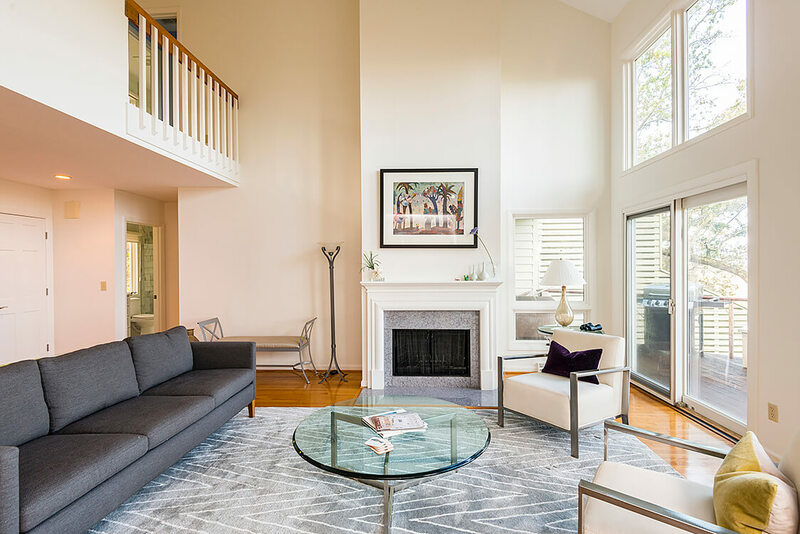 A light-filled living room opens up from the moment of entry. 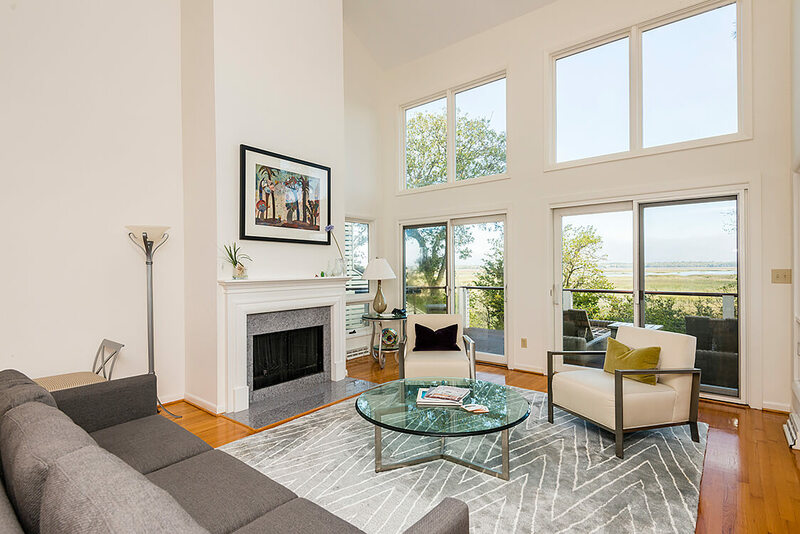 Rising more than two stories beneath a vaulted ceiling, one wall is filled with two tiers of floor-to-ceiling windows framing the breathtaking river views. 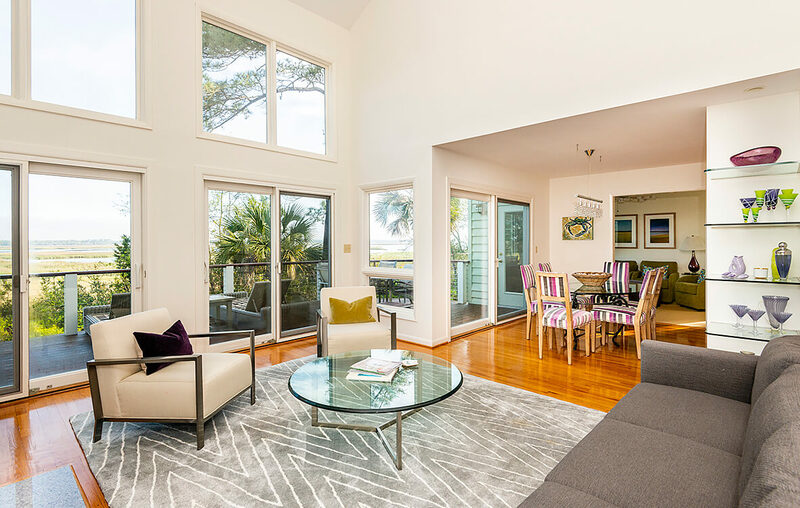 On the opposite side, a second-floor gallery overlooks the space. 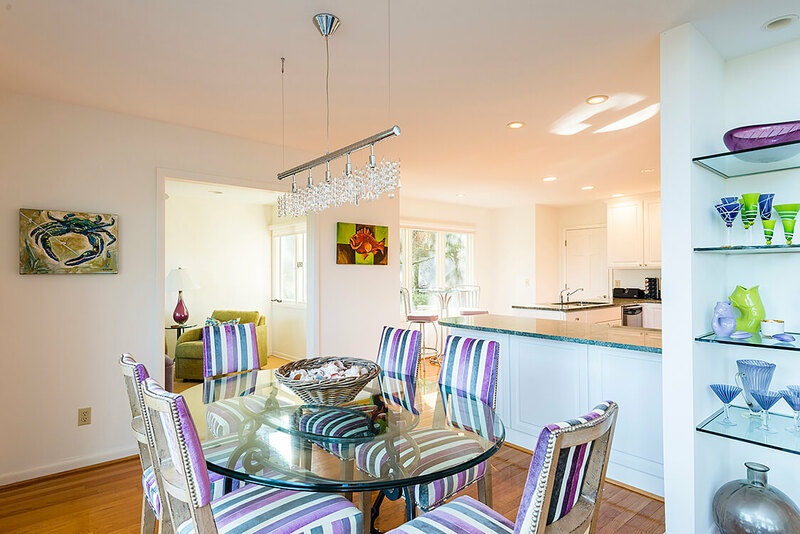 The hardwood floors extend into the dining room and kitchen. 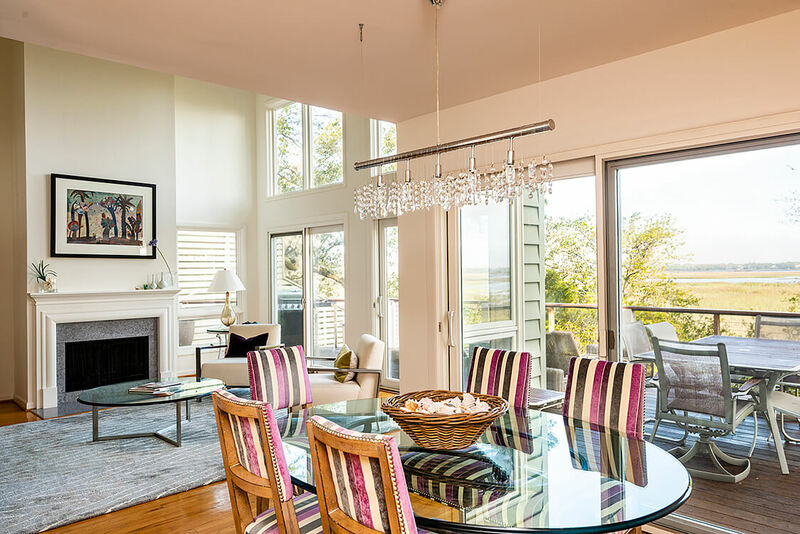 The sunny dining area offers direct access to the home’s expansive rear sundeck via a wide glass door, and an adjacent breakfast bar offers extra serving space while entertaining. 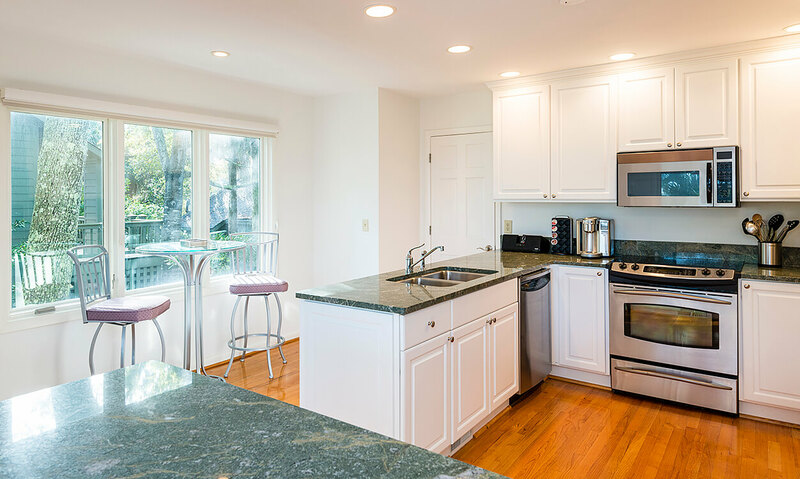 The white kitchen features clean raised-panel cabinetry, all stainless-steel appliances, and granite countertops. 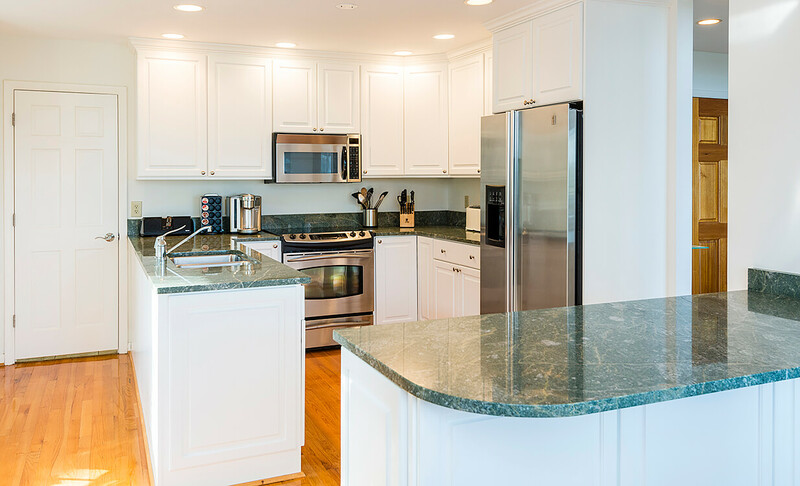 There’s a pantry for extra storage, and the refrigerator includes a water dispenser and ice maker. 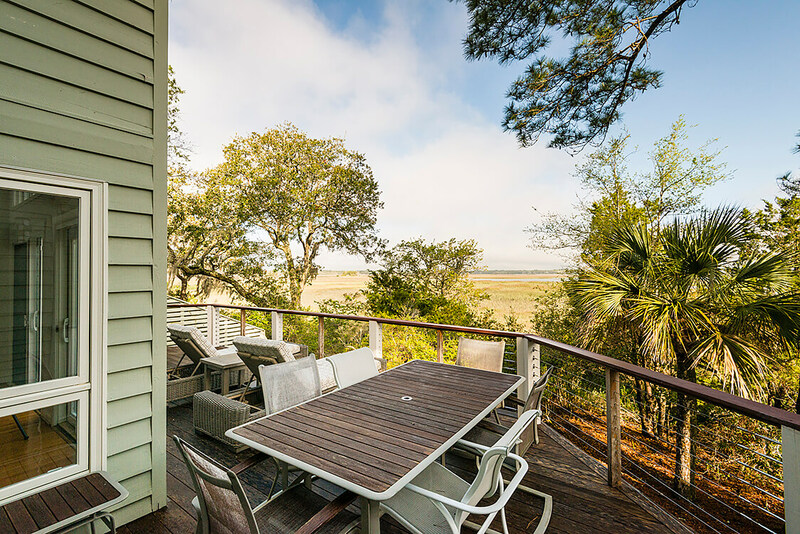 A tall, glass-topped pub table with two chairs provides a casual spot for morning coffee or drinks while chatting with the home chef, and there’s an adjacent den, with its own glass door leading to the sundeck, for lounging. 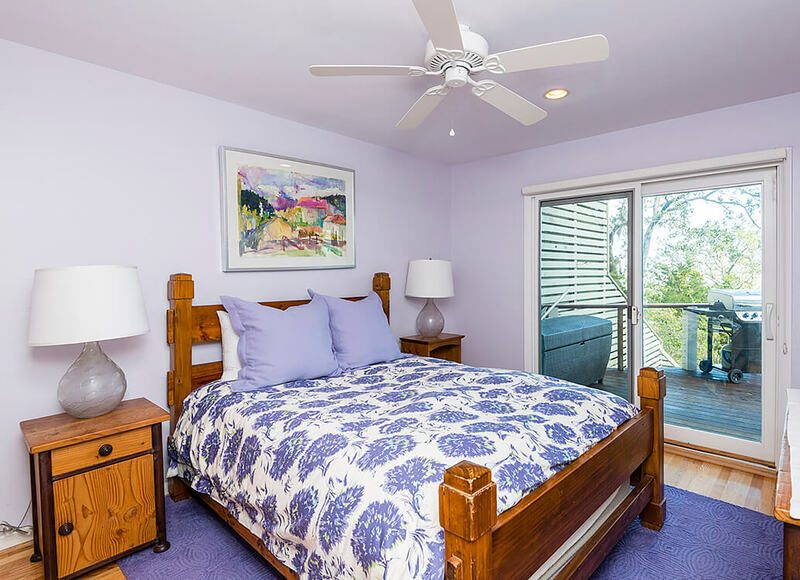 Also on the first level is a guest bedroom with private access to the sundeck and an exquisite full bath with spa-like finishes and hues, and a wide, waterfall-tiled walk-in shower. 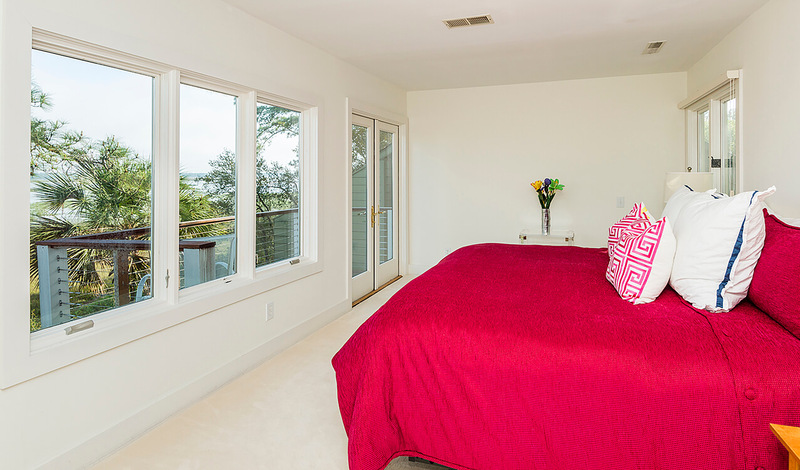 The generously sized master suite fills the majority of the second floor. 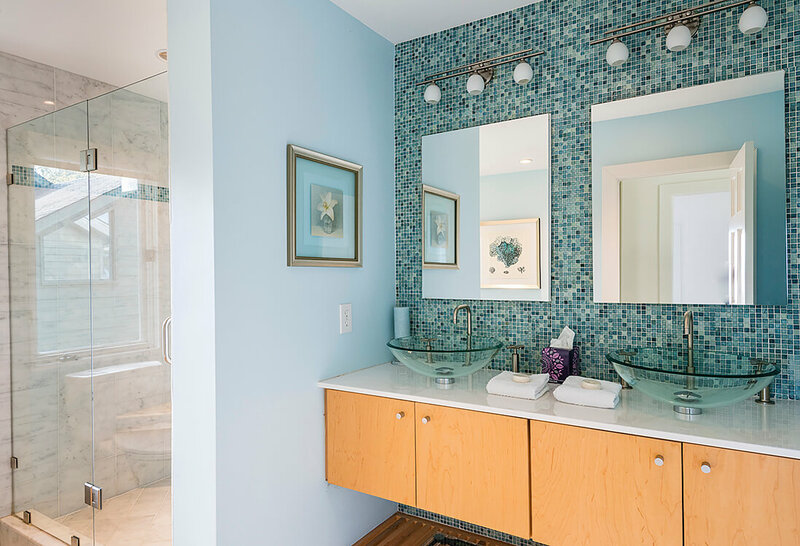 The bedroom opens to a private second-story deck, and the master bath is striking with a blue tiled accent wall, floating vanity with his-and-hers glass vessel sinks, a large Jacuzzi tub with a sleek standalone faucet, and a deep frameless-glass walk-in shower. 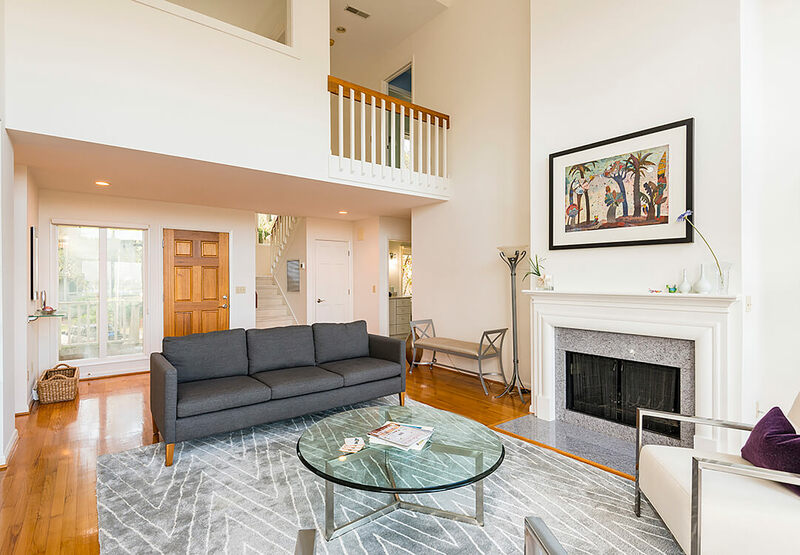 A light-filled master suite study, which can also be accessed from the second-floor landing, offers an open window overlooking the living room with its views out to the river. 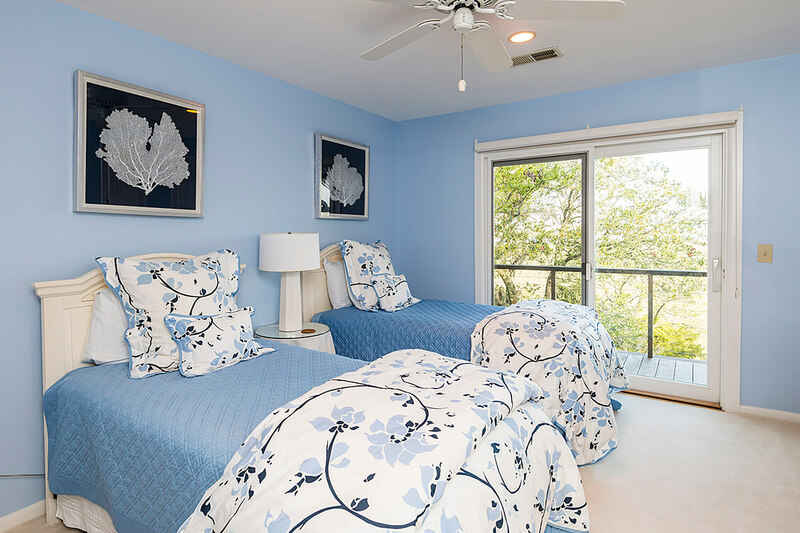 The second-floor guest suite, painted in hues of pale blue and cream, sleeps two in twin beds very comfortably and offers its own private deck for coffee or cocktails. 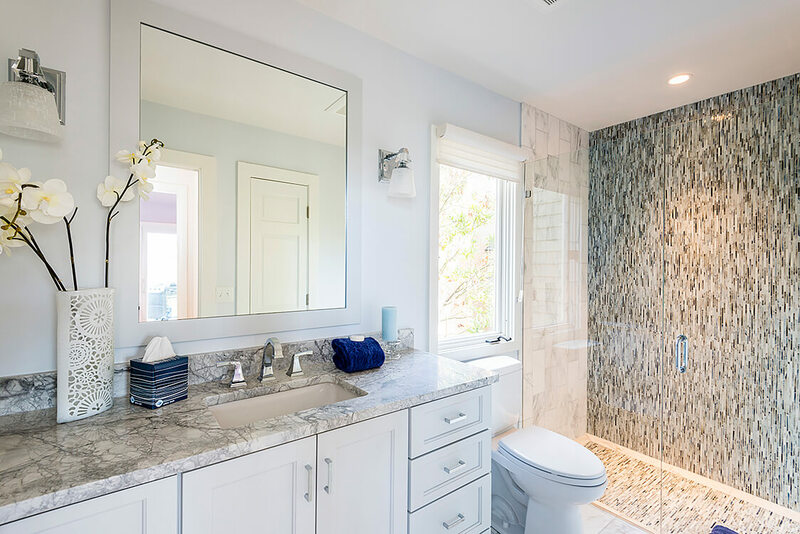 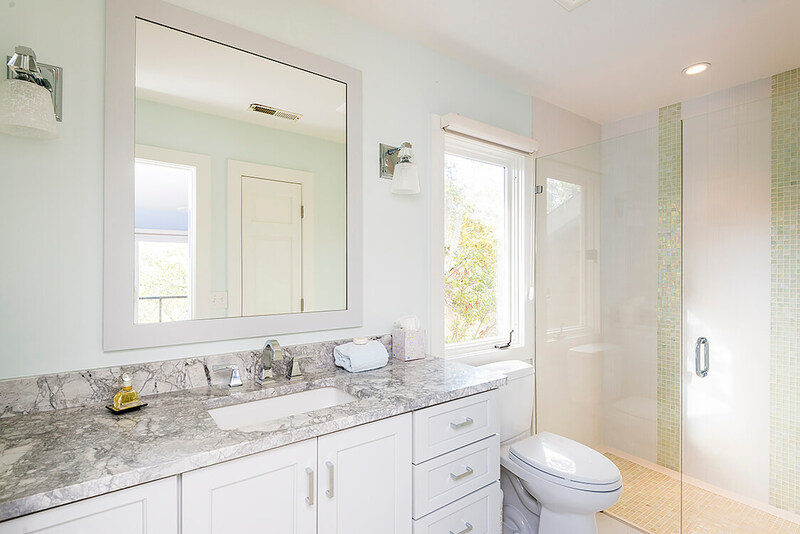 Its bath is as spectacular as the downstairs bath, mirroring its layout, hues, finishes, and wide frameless-glass walk-in shower with beautiful tiling. 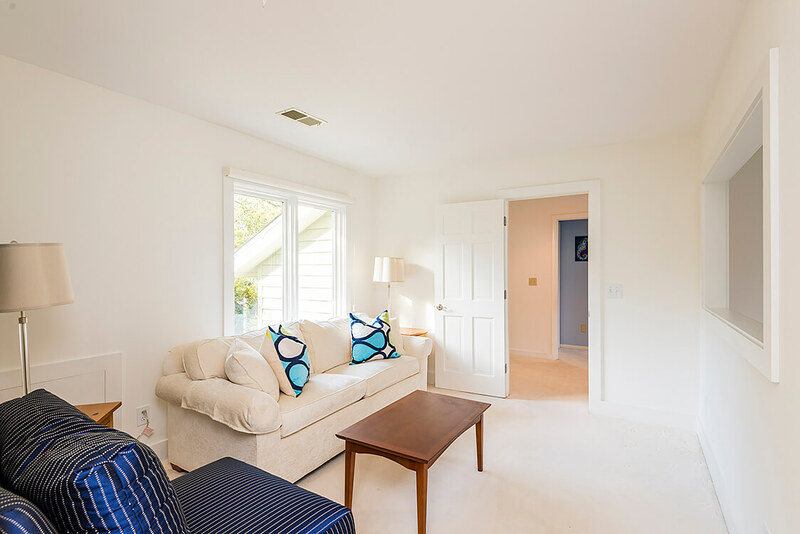 This modern, clean-lined home is available fully furnished. 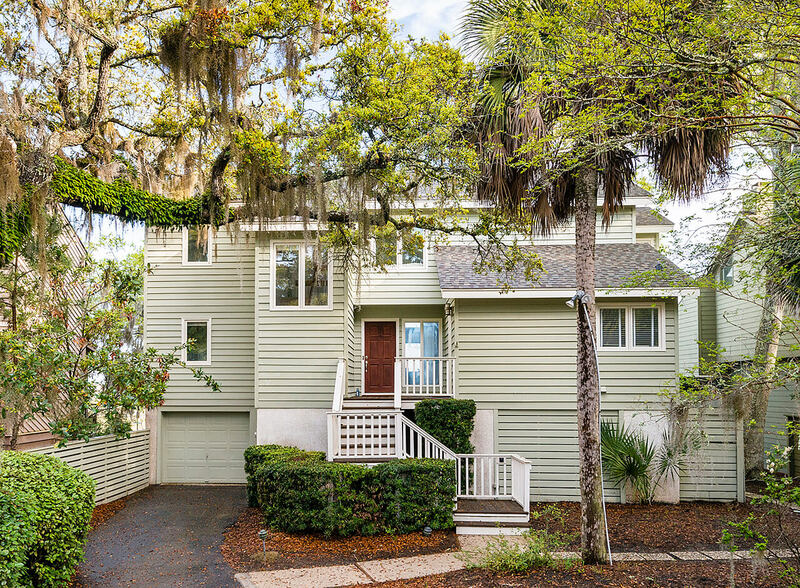 Additional features include a new Trane® HVAC, new roof, and proximity to the Gary Player-designed Cougar Point golf course, the coming amenities of West Beach Village including a top-tier inn with seaside restaurant and a new clubhouse with sports tavern, and the boutiques and eateries of Freshfields Village.